In a recent conversation with Michael DiAsio, owner of Visiting Angels Las Vegas, DiAsio said that he expected self-driving cars would reshape the senior care landscape. “I think that will be the biggest change in the next five to ten years,” DiAsio said. Driving is one of the biggest issues for seniors. As soon as we hit retirement, our risk of getting into an accident begins to climb. Age-related problems with eyesight, motor skills, reflexes, and cognitive ability can increase the risk of a major accident. Sooner or later, seniors reach the age where it’s simply safer to hang up the keys. That makes transportation a key issue for seniors, who often struggle to get from place to place without assistance. Right now, seniors might turn to family members, taxi services, public transportation, or their home care service worker for help with transportation. But relying on other people and/or services can rob seniors of some of their independence. That could change with self-driving cars. Right now, we’re still a few years away from self-driving cars becoming a major force on the American market, but when they do, you can expect big changes to the way seniors get from place to place. Self-driving cars will likely not require a license, and there will be no increased risk for elderly riders. This makes them ideal for senior transportation. So if an elderly family member needs a vehicle to get them to their bridge game, their doctor, or the local supermarket, a self-driving car could be the perfect option. For elderly care providers, like Michael and his wife Jackie, it will also mean that they can worry less about how their clients get from point A to point B. Instead, the DiAsios can focus on what they do best: providing compassionate, quality elderly care for Las Vegas’s seniors. 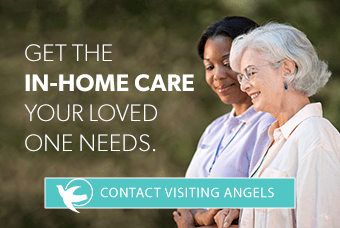 Contact your local Visiting Angels office today for a no-cost elderly care consultation and to learn how our senior care services can help your loved one live safely at home.